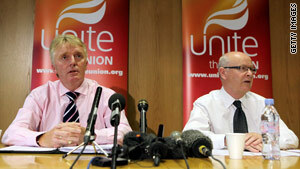 Brian Boyd and Brendan Gold, the Unite union's officers for civil aviation, annouce result of vote to go on strike. London, England (CNN) -- Six major British airports, including London's Heathrow, could shut down after employees of airport operator BAA overwhelmingly voted to go on strike Thursday in a dispute over pay, union officers said. Unite union officers Brian Boyd and Brendan Gold said members voted 2,263 to 791 to strike. "This clear mandate will cause the closedown of six UK airports," the union said. In addition to Heathrow, the airports are Stansted and Southampton in the London area, and Edinburgh, Glasgow and Aberdeen in Scotland. The union will meet Monday to decide when to strike. At least seven days notice must be given to BAA. BAA included a statement on its website apologizing for the uncertainty caused by the strike action. "At this stage no dates for industrial action have been announced and no flights from our UK airports are affected. More than half of those eligible to vote have not done so and we believe the ballot result does not provide a clear mandate for strike action," the statement says. "We believe that our offer of a conditional 1.5% pay increase is fair and reasonable during a very difficult economic climate for the aviation industry. We hope that the trade union will engage with us quickly to conclude an agreement, and we have suggested talks." CNN's Per Nyberg and Ayesha Durgahee contributed to this article.